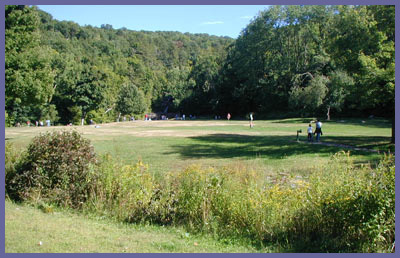 Main Attractions: Spectacular waterfall, nice vistas, open field, picnics, wooded trails. Kent Falls State Park is located 5 miles north of Kent, CT on Route 7 and is probably the most known and visited falls in the state of Connecticut. The main attraction is the falls, obviously, but the park is a great place to have a picnic, take in some fresh air, throw a frisbee around, or just people watch on a busy day. There's a small trail loop that goes up the falls, over into the forest, and back again to main parking area. Most just visit the falls however. In 2007 Kent Falls celebrated the new landscaping and path leading up the side of the falls. So everything now is nice, safe, and primed for great lookouts over the falls. Unless there are drought-like conditions, the waterfall runs hard and if it has rained substantially or if we get a large snow storm late winter followed by warm weather, the blasting cascades put on a spectacular show. Most of the falls are not visible from the road and just the last bit of it from the parking lot. You'll have to hike up a short but steep trail to see it all. The path and wooden lookouts are regularly maintained which allows visitors to climb right up along side the falls all the way to the top for post card views of the water. The trail to the top is about a 1/4 mile and the vertical height of the entire falls is around 150-200 ft. This is not a long hike but does go straight up and those with asthma or heart problems should go very slowly. But the trail is accessible to nearly everyone. Children should be watched carefully since the excitement of the falls can sometimes entice little ones to get close or touch the water. This is extremely dangerous and there have been some terrible accidents at Kent Falls because some are naive to the power of the water. Surrounding the falls is a trail loop which offer some nice views and quiet forest walks. It's best to look at the posted trail maps to get an idea of the color codes and how the trail is laid out. It's not extensive but still always smart to have an idea about it before venturing in to the forest. There is a charge per car on weekends and holidays ($7 for Connecticut cars and $10 for out of state cars) during the week it is typically free. Between November and April there may be no charge on weekends as well since the winter months don't get nearly as much visitors. Charging a fee they obviously are taking advantage of the popularity of the falls but it's also smart because they can use those resources to keep the park clean and supervised at all times. It's a good deal all things considered. The hiking is nice but honestly the waterfall is the big attraction. A trail system of a main trail plus red and yellow blazed into the forest is there for you (click on the link below for official state park website and download a map). If you like to picnic next to a beautiful waterfall, relax and people watch, it's certainly worth the investment of time to drive on up. If you're a motorcyclist it's also a great place to enjoy a natural setting without worrying whether your bike is going to be okay while you're gone on the hike. Memorial Day, 4th of July, and many beautiful weekend summer days it can get filled up in the parking lot. Kent Falls is right off Route 7 which is one of the most popular scenic drives for folks looking to escape southern CT or metro NYC area. 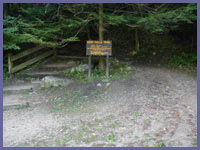 Visit the official state park website for telephone numbers to call for info regarding Kent Falls State Park. Kent Falls official website. The phone number as of 2007: (860) 927-3238. If this link or phone becomes outdated do an internet search for Connecticut Department of Environmental Protection to find their official website. Once at the website in search box type in "Kent Falls State Park".